Seriously has it been 30 years since I graduated from high school? And some of the people in these pictures I have known since the 3rd grade. 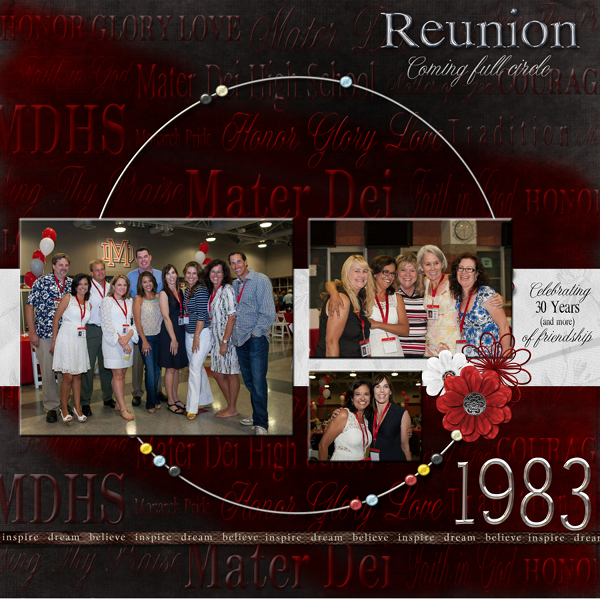 It was a great reunion and especially touching since my daughter graduated from the same high school. I was able to use my background paper from Duetica fonts and bits and pieces from various kits. I tried something new with my lettering by using the metallic effect and I love the way it works with my Duetica fonts. This entry was posted in Artwork, cards, Decor, Design Team, Designers, digital, Inspirational Ideas, Party, scrapbook album, scrapbook page and tagged artwork, card making, cards, decor, Design Team, Duetica, Duetica Lettering Arts Studio, Fonts, home decor, scrapbook, Scrapbookers, scrapbooking. Bookmark the permalink.